Wendy Johnson, the talented woman who designed this pattern, has a wonderful two-page viewing gallery of knitted cat beds in all kinds of colors and variations – as varied, in fact, as the pampered cats occupying them. Wendy’s Kitty Bed Gallery is well worth a visit, especially if you plan on trying your hand at knitting this felted cat bed! 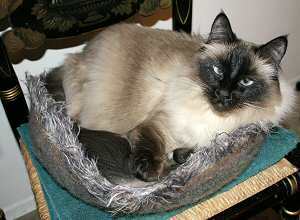 Lucy’s Kitty Bed — a Felted Cat Bed for the Kitty Who Has Everything! I think of this as a Kitty Pi, because the shaping is based on the increases used in Elizabeth Zimmerman’s Pi Shawl. Think of it as a pie shell with your kitty as the filling! You can use any bulky weight 100% wool yarn that will felt. You can switch to your circular needle at this point. Here it is after knitting — it’s about 28″ in diameter, not including the sides. Felt the bed by placing it in a zippered pillowcase cover and washing it in the washing machine on a hot wash/cold rinse cycle with a bath towel in the washer for added friction, until it reaches the finished size you want. I ran mine through two cycles, then I stretched it over a Tupperware pie carrier with a bath towel folded up and taped around it (photo at left). And put it on top of a box (see photo at right) and left it to dry. The finished size is approximately 17″ in diameter. Note: I was a bit over-zealous in my blocking the first time around. But that’s the beauty of felting — after going through another cycle in the washer, it’s at the size I want now — about 15″ in diameter. © 2003-2016 Wendy D. Johnson – Permission to redistribute for non-commercial use is granted provided that this copyright notice is included.